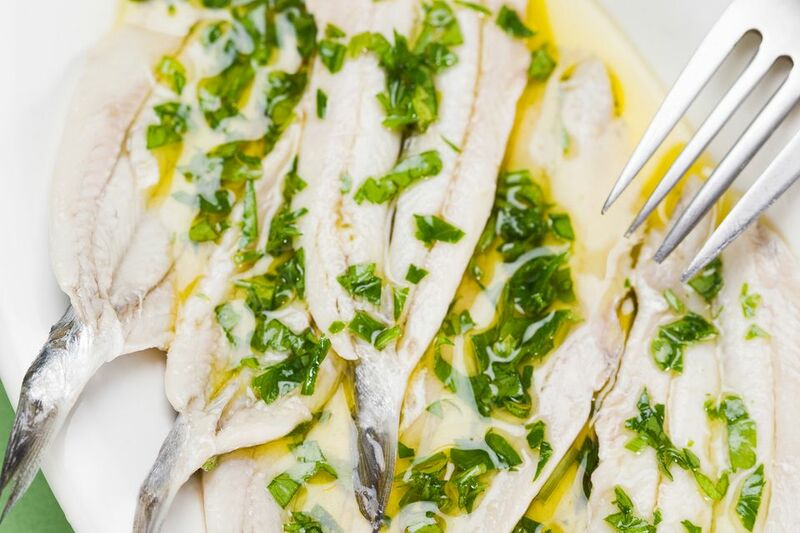 Call them boquerones, gavros or just white anchovies, these little morsels are trendy. 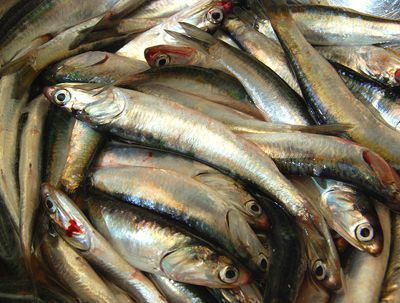 Boquerones — pronounced bo-keh-ROAN-ess — are not your mother's anchovies. They're sweet, firm, tart and not even remotely like the brown anchovies you find in cans. Making boquerones takes a couple of days, so plan ahead. The great thing about them is that they're lightly cured so they stay in great shape for up to 30 days in the fridge. Start with very fresh anchovies and clean them well, then follow these easy instructions. Place a layer of kosher or pickling salt on the bottom of a non-reactive container — plastic, ceramic or glass will all work. Then layer the clean, washed anchovies on top of the salt. Add another layer of salt then another layer of anchovies. The salt pulls moisture from the fish and makes them firmer. Now gently pour in enough vinegar to cover the anchovies. What kind of vinegar? It depends. Greeks use red vinegar. Spaniards use either white wine vinegar or sherry vinegar. Both are excellent. Use whatever vinegar you'd like. You can also use lemon juice in a pinch. Let the anchovies marinate in the fridge for about 12 hours. You can leave them for as long as 24 hours, but your fish will be more vinegary. Drain and discard the vinegar. Remove the backbones of the anchovies by slicing each anchovy in half lengthwise with a sharp, thin paring knife, exposing the spine. Use the tip of the knife to lift the bone up and out. The anchovies will have softened from the vinegar so the spine should pull out easily, but be gentle and don't force it. You might see a few tiny fragments of bone left behind — scrape them out. Now you have a boneless anchovy split down the middle. The flesh will have turned white — thus the name "white anchovies." They may be blushing red, depending on the vinegar you use. Get some top-quality garlic — farmer's markets often sell specialty garlic — and some flat-leaf parsley. Chop both very fine. You'll need five to six cloves of garlic and about 1/2 cup of finely-chopped parsley for one pound of anchovies. Use a top-quality olive oil for this step. Try a locally-made extra-virgin oil infused with lemons. Coat the bottom of a container with oil. Sprinkle the oil with a little of the parsley and garlic, then place a layer of anchovies on top. Repeat the process until you're out of anchovies, then top it all off with a little more olive oil. Shake the container from side to side to release any trapped air, then seal it and place it in the fridge. Your boquerones will be ready to eat in as little as four hours, but they're better when they're left for a full day. You can eat them plain, but they're better on good crusty bread or as a topping for pasta. Boquerones are excellent on crackers, too. Spaniards eat them with dry fino sherry and Greeks eat them with raki or ouzo. A cold martini would make an excellent American accompaniment.